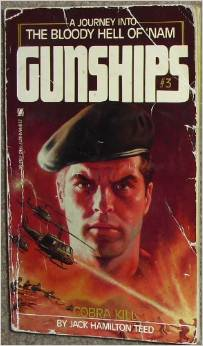 Gunships – THE BOOKS THAT TIME FORGOT. Colonel John Hardin and his men are returning from their last adventure with the Corsican mafia when they come upon a squad of marines under attack at a temple. After they rescue them and find out they are guarding a beautiful photojournalist. Also they recover a strange gas mask. Further examination of the mask points to a highly sophisticated mask of Chinese origin. Combined with reports from remote villages in Laos of a highly deadly gas they call sky fire. It points to a Chinese nerve gas being developed for use against US troops in Vietnam. 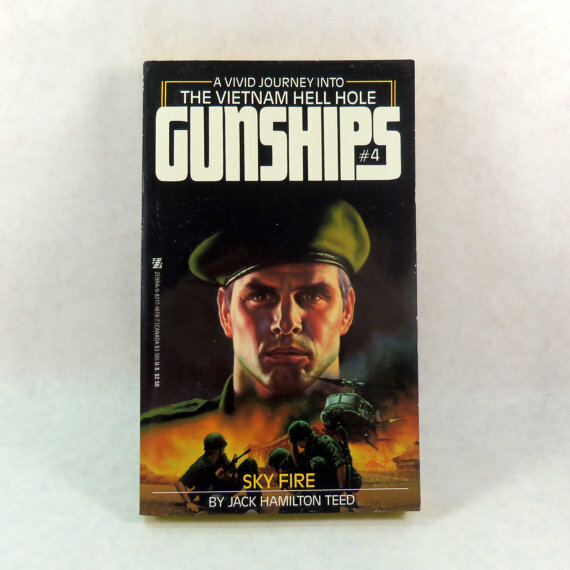 Hardin is later kidnapped by General Tho the dapper North Vietnamese that Hardin had a run in with the first two books. He wants Hardin to destroy the nerve gas facility across the DMZ. Tho has concerns of growing Chinese influence in the government. He gives detailed plans for the facility. Hardin and his men go off to destroy it. On the way they join up with the marine squad and the photojournalist who are in fact KGB agents. The Soviets are also concerned with growing Chinese influence in Vietnam and join forces. The final book in the series has it all. Evil Chinese scientists and beautiful KGB agents. Now does it make sense that the Vietnamese would use a massive nerve gas attack. Well that one of the large logic gaps you could fly a 747 through with plenty of wing room to spare. You just have to go with it. I notice for a Vietnam war series that the North Vietnamese are not really the main enemy in any of the books. Sure they are killed by the boatload but they just seem to be in the way. The real enemy is the corruption in the army. Traitorous generals, rogue redneck special forces with CIA support, Corsican/Sicilian mafia also with some CIA support. Now the last is the evil Chinese and their new nerve gas. I guess this is the Vietnam war through the eyes of an Englishman. It was an enjoyable journey through the pulpy books of yesterday. The story starts with a Huey helicopter on a secret courier mission from Laos being intercepted and shot down by three other Hueys. Colonel John Hardin is once again sitting around waiting for an assignment. He is still in the doghouse with the high command. He decides to take a joy ride with his friend Captain Marco in a cobra gunship. While flying along they discover the wreckage and decide to investigate. Suddenly another helicopter comes up and shoots them down. Hardin survives and fights off a patrol of NVA but one gets away with something from the downed Huey. 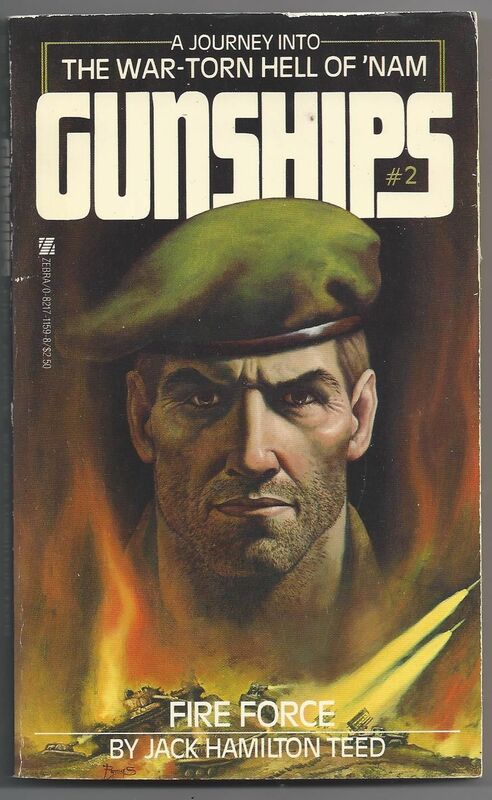 Now Hardin has to know what was so important for the NVA and why are American helicopters shooting down other copters.The trail leads to a rubber plantation run by a shady Frenchman. Hardin and his ragtag group of misfits now find themselves in the middle of a drug war between the Corsican Brotherhood and the Sicilian Mafia for control of the heroin trade for Southeast Asia. The third book was one I got for my Christmas break back when I was fifteen. It was a fun experience to read it again on this Christmas break. I thought it was a fun book with the mystery in unraveling the mysterious bag and the helicopter incidents. Now that I have the entire series some of the other incidents make sense and I understand the background of the characters more clearly. Special forces teams are being ambushed at an alarming rate in Laos. A helicopter incursion into Cambodia results in the unit being ambushed. The sole survivor to escape Captain Marco tells that the ambush was done by renegade Americans. Colonel John Hardin is assigned the mission to find these renegades. Now Hardin is on the outs with the high command for killing the treasonous general from the first book. But they need his expertise so they give him the gang of misfits from the last mission. With a sergeant who fragged his lieutenant. A mob hitman who’s favorite weapon is a piano wire garret. A pill popping medic named Pepper. Doc Pepper get it.(HA!HA!HA!) This motley crew must infiltrate the renegades valley base run by a crazy redneck major with plans of waging his own nuclear war on the commies with help from a CIA faction. The second book in this series. Some of the dialogue is just what the English must envision all Americans talk like. The redneck major makes Larry the Cable Guy look Harvard educated. The black Captain Marco always talks in over the top jive. Because lets face it all black guys in the seventies were from Harlem and spoke jive. Even a college educated man like Marco. Its another fun book with a truly wacky cast of characters and situations. I’m glad I got it for my vacation. Colonel John Hardin is a officer that has just made an enemy of a corrupt American general. General Dempsey needs someone to deliver a package in Laos and Hardin refuses knowing that the mission is shady. He threatens to expose the general’s cover up of a massacre. Now Dempsey decides that Hardin is too dangerous to live. He arranges for the helicopter he’s on to blow up over Laos. He then mounts an expedition using criminals from the brig as cover for his true mission. It involves passing off intelligence that could cause the death of thousands of American soldiers. Hardin survives the crash. He links up with the criminals that were destined to be killed. Together they must fight off a ruthless North Vietnamese general and expose the corruption of General Dempsey. For my Christmas vacation I decided to get all four books in this series. I remember picking up the third book as a teenager to read for my Christmas vacation and it seemed fitting to track down the other books to complete my collection. The first book is a solid action story. 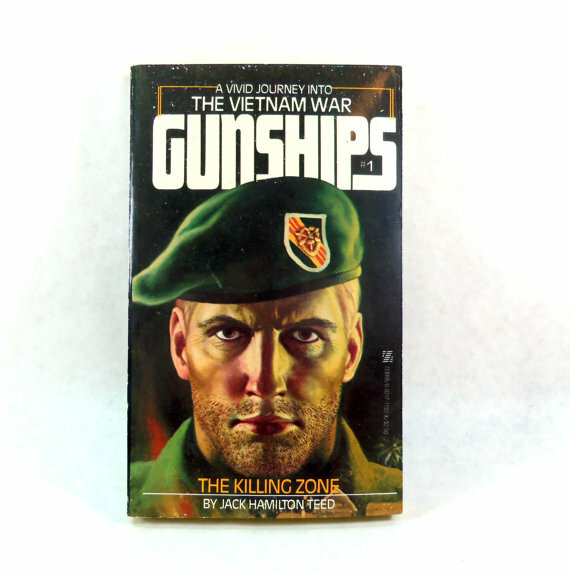 It is written by an English author who’s only knowledge of Vietnam is watching movies like Apocalypse Now and the Deer Hunter. He makes up his own slang words that I never encountered is books written by veterans. Indeed he uses English words that seep into the Americans dialogue. I think it kind of adds to the charm of its bad pulpy feel. So there is no authenticity to the stories but they are an enjoyable and interesting action story.